Last weekend (the 25th), we decided to transfer the beer into the secondary fermenter. It definitely smells like alcohol now, so that's a fun surprise. As you can see in the last photo, it's quite pale for a stout. Note from the editor: The stats in my Google Analytics account tell me that you guys aren't really into these beer brewing tales, so they'll no longer be Tuesday features -- just a little something extra. Siphon the beer from the primary fermenter into the "carboy" (secondary fermenter). 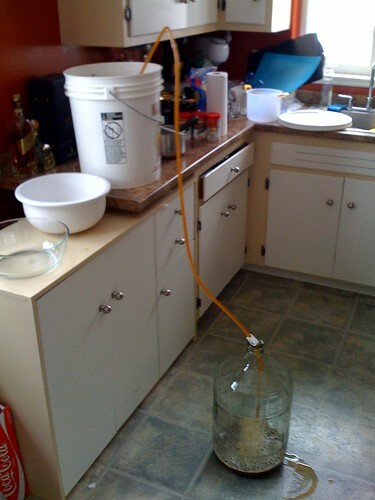 This usually takes a few tries and you're guaranteed to get some partially fermented beer on the floor. Get a dog to lick it up. 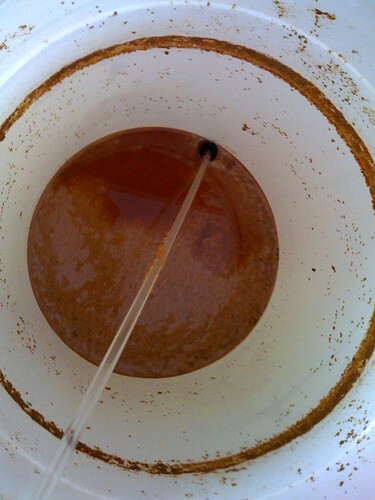 Yeast sludge in the bottom of the "deluxe" primary fermenter. Perhaps we should have made some Vegemite with this. 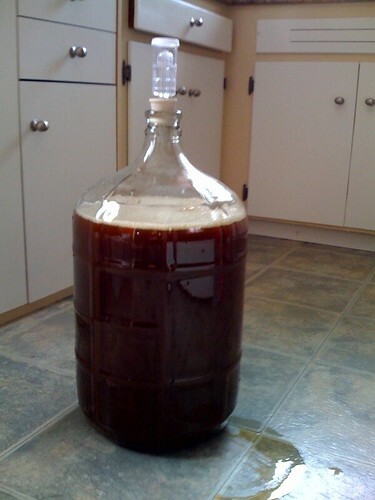 The carboy all full and sealed up with the air lock. This lets the beer continue fermenting without sitting on a bunch of yeast sludge. also - i have two dogs for hire who love to slurp beer from the floor.